It's no secret to anyone that knows me that I love pandas. So it's no surprise when, every Christmas, during our secret santa gift gathering, I unwrap my package and find panda-related goodies. Last year I was given a panda hood, which I thought would just lay around unused at home, but has turned out to be quite useful at keeping my head warm at home in the winter. Of course, whereas I looked goofy and maybe slightly intelligence-impaired in my panda hood, these models look HOT in their Spirit Hoods! The full hood comes with an attached scarf and wee paws which double as mittens. 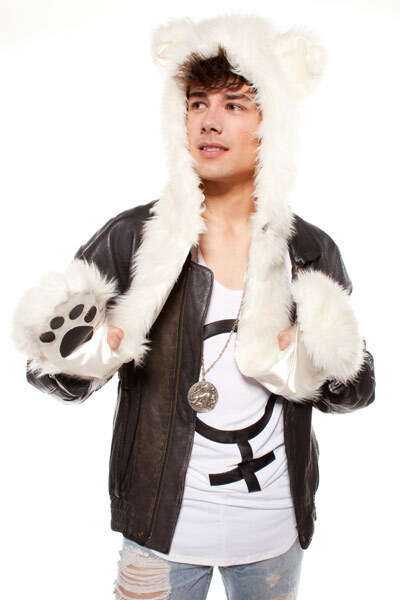 And if you buy, a portion of proceeds is donated to wildlife funds to save polar bears and wolves, etc. Too bad they don't ship to Hong Kong. Although I can't see anyone I know paying US$150 to buy a furry animal hood, even if it does go to charity. RAWR.